This is a Dutch name; the family name is Van der Pol, not Pol. 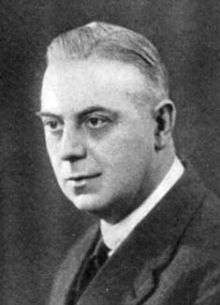 Balthasar van der Pol (27 January 1889 – 6 October 1959) was a Dutch physicist. Van der Pol studied physics in Utrecht, and in 1920 he was awarded his doctorate (PhD). He studied experimental physics with John Ambrose Fleming and Sir J. J. Thomson in England. He joined Philips Research Labs in 1921, where he worked until his retirement in 1949. His main interests were in radio wave propagation, theory of electrical circuits, and mathematical physics. The Van der Pol oscillator, one of the most widely used models of nonlinear self-oscillation, is named after him. He was awarded the Institute of Radio Engineers (now the IEEE) Medal of Honor in 1935. The asteroid 10443 van der Pol was named after him. Van der Pol became member of the Royal Netherlands Academy of Arts and Sciences in 1949. ↑ "Balthasar van der Pol (1889 - 1959)". Royal Netherlands Academy of Arts and Sciences. Retrieved 3 August 2015. This article is issued from Wikipedia - version of the 4/9/2016. The text is available under the Creative Commons Attribution/Share Alike but additional terms may apply for the media files.